'Sometimes the Line Walks You' bears sonic similarities to Nick Cave & The Bad Seeds, Adam Turla manages to sound just like Nick Cave and the instrumental backing is just as chaotic and unpredictable as anything from the Bad Seed's catalogue. 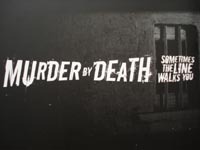 Murder By Death themselves are a wonderfully country indie four-piece from Indiana whose music conjures images of Johnny Cash, Nick Cave and other country legends and mixes that with brilliant guitar riffs and excellent keyboards. 'Sometimes the Line Walks You' is the latest single from the band's excellent third full length album 'In Bocca Al Lupo' and manages to build on the strength of previous singles 'Boy Decide' and 'Brother'.